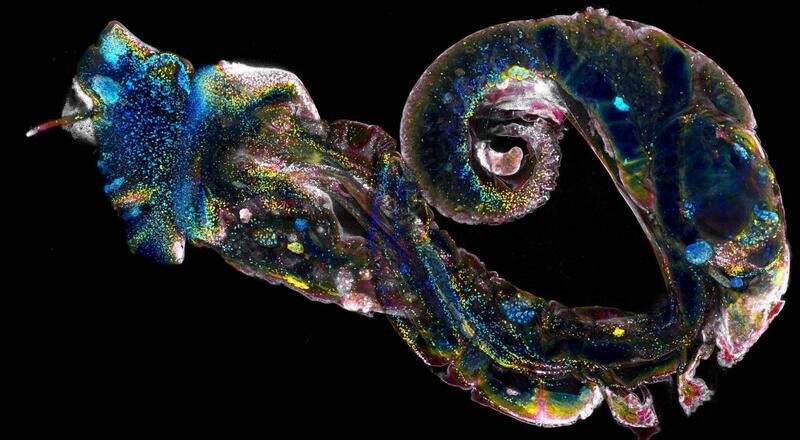 This confocal microscope image shows a small snail, removed from its shell, which is infected with schistosome parasites. The snail plays a key role in the life cycle of the parasite that causes schistosomiasis, a neglected tropical disease that sickens hundreds of millions of people. The Phillip Newmark lab at the Morgridge Institute is seeking new avenues to fight the disease. Health authorities of the western Mozambican province of Tete on Monday launched a massive campaign for the treatment of lymphatic filariasis, commonly known as elephantiasis. The launching ceremony took place at the Castro Teófilo Primary School, in Tete, where the provincial governor, Paulo Auade, urged the population to heed the calls of the health authorities and rush immediately to the treatment centres. “Everyone is called to go to the treatment centres. Community leaders, religious leaders, parents and guardians should all spread the message which will allow us to reach our targets,”said the governor. This study represents the first community-wide, integrated clinical case mapping of both [lymphatic filariasis, or] LF and podoconiosis in Ethiopia. It highlights the high number of cases, particularly of leg lymphoedema that could be attributed to either of these diseases. This key clinical information will assist and guide the allocation of resources to where they are needed most. Ramakrishna U. Rao et al. The Sri Lankan Anti-Filariasis campaign distributed five rounds of mass drug administration (MDA with diethylcarbamazine plus albendazole) to some 10 million people in eight districts between 2002 and 2006. Sri Lanka was recognized by the WHO for having eliminated lymphatic filariasis (LF) as a public health problem in 2016. However, recent studies by our group documented pockets with persistent LF in coastal Sri Lanka, especially in Galle district. The present study was performed to reexamine an area previously identified as a potential hotspot for persistent LF. William Sullivan, a professor of molecular, cell, and developmental biology at UC Santa Cruz, has spent much of his career studying the basic biology of the cell cycle in the fruit fly Drosophila. To study the interactions of Wolbachia with its insect hosts, he created a stable cell line of Wolbachia-infected Drosophila cells which he could grow indefinitely in the laboratory. This cell line turned out to be an invaluable tool for researchers seeking new drugs to treat river blindness and related diseases. The approach using medicinal plants used in traditional medicine is a possible alternative method to cure onchocerciasis. . . Several plant groups of compounds were shown active against Onchocerca sp. [via in vivo acute toxicity assays and/or in vitro cytotoxicity tests] such as tannins, alkaloids, triterpenoids and essential oils. Nevertheless, none of the active compounds was subjected to clinical trial, to assessment of its diffusibility through nodular wall or its capability to induce genetic resistance of Onchocerca sp. Our study demonstrates that people with schistosome infection at the time of HIV-seroconversion develop adverse HIV outcomes more slowly than those without. The findings are contrary to our original hypothesis. Our current longitudinal findings suggest complex interactions between HIV-1 and schistosome co-infections that may be modulated over time. We urge new immunological studies to investigate the long-term impact of schistosome infection on HIV-1 viral load and CD4 counts as well as related immunologic pathways. A pilot study using wearable global positioning system data loggers to compare water contact levels: Schistosoma . . . The parasitic disease schistosomiasis is one of the developing world’s worst public health scourges, affecting hundreds of millions of people, yet only a single, limited treatment exists to combat the disease. Researchers at the Morgridge Institute for Research are searching for potential new targets by probing the cellular and developmental biology of its source, the parasitic flatworm Schistosoma. . . “Understanding how these stem cells drive the development of each life-cycle stage may ultimately help prevent disease transmission,” says senior author Phillip Newmark, a Howard Hughes Medical Institute and Morgridge investigator and professor of integrative biology at the University of Wisconsin-Madison. Few studies have evaluated changes in the spatial distribution of human schistosomiasis and the impact of and variations in factors that promote the transmission of schistosomiasis in Jianghan Plain. In the present study, we employed spatial and space–time scan statistics to analyze the clusters and number of people infected with schistosomiasis. Furthermore, the Geodetector software was used to assess the environmental risks to human schistosomiasis rates in Jianghan Plain from 2007 to 2012. Utilizing two different worm indices data available, our findings showed negative associations between helminthic neglected tropical diseases (NTDs) and both human development and educational indicators for children globally. The negative links to [Human Development Index, or] HDI for all 191 nations globally extend previous information provided for the 25 largest nations and OIC countries, respectively, while our new findings—the negative associations with educational development, including school enrollment rate, mean years of schooling, and school persistence—generate a number of potentially interesting hypotheses for further testing. Kagera leaders and the general public have been urged to take a holistic approach in eliminating preventable diseases that hinder proper growth of children. People should also get correct information on strategies taken by the government in controlling the diseases. . . About 600,373 pupils in primary schools were expected to be administered with deworming tablets. The government will distribute Albendazole antiworm tablets for children aged between five years and 15 years free of cost. The aim of this study was to determine the prevalence of these soil transmitted helminth parasites in selected communities (Rumuewhor, Ubimini and Elibrada) of the Niger Delta in Nigeria. 300 soil samples were collected randomly from school fields, roadsides and around residential areas in the three communities from December 2016 to May 2017. . . The study has highlighted the public health implications for the people who live in the communities studied and has recommended the improvement of basic environmental and sanitary conditions of the populace and the need for health education programs. Co-infection of malaria and intestinal parasites is widespread in sub-Saharan Africa and causes severe disease especially among the poorest populations. It has been shown that an intestinal parasite (helminth), mixed intestinal helminth or Plasmodium parasite infection in a human induces a wide range of cytokine responses, including anti-inflammatory, pro-inflammatory as well as regulatory cytokines. Although immunological interactions have been suggested to occur during a concurrent infection of helminths and Plasmodium parasites, different conclusions have been drawn on the influence this co-infection has on cytokine production. The [soil-transmitted helminthiasis, or] STH Coalition Action Group provides strategic direction and guides STH Coalition activities. The 2018 STH Coalition Action Group meeting was held in Atlanta, GA on May 8-9, 2018. The meeting addressed the need to monitor progress toward achievement of the 2020 global targets and shared preferred practices with a focus on monitoring and evaluation of STH programming. Quietly, in the shadow of fights against better-known diseases like Ebola, AIDS and malaria, the 20-year battle against trachoma is chalking up impressive victories. Those successes, experts say, show the wisdom of advocating and enforcing basic public health practices, rather than waiting for a miracle cure or a new vaccine. They are also a testament to the unheralded but steady generosity of Americans. Much of the progress was made through donations by an American drug company, American foundations and American taxpayers. To mark NAIDOC Week 2018 and this year's theme 'Because of Her, We Can! ', Vision 2020 Australia is celebrating the roles and achievements of some of the incredible Aboriginal and Torres Strait Islander women working in the eye health sector. . . Simone is a Yankunytjatjara woman from the Anangu Pitjantjatjara Yankunytjatjara Lands in remote South Australia. Simone works with Indigenous communities and health professionals across Australia to inform a model of best practice to work towards the elimination of trachoma in South Australia, and is passionate about improving health outcomes for Indigenous communities. Yaru Water is proud to announce a partnership with The Fred Hollows Foundation. During this financial year we will be looking to raise $50,000 ($150,000 over three years) to work towards a world in which no person is needlessly blind and Aboriginal and Torres Strait Islander people exercise their right to good health. . . With almost 70% of Australia’s Aboriginal and Torres Strait Islander people living in regional, remote, and very remote regions, access to high quality and culturally-appropriate health care is an essential step in closing this health gap. Dr Sanduk Ruit was working as an eye surgeon in his home country of Nepal long before he met Fred Hollows. But Ruit says it was Hollows who gave him the audacity to pursue his lifelong dream, to completely eradicate preventable blindness from around the world. Likewise, Hollows said it was Ruit who inspired him to move his work from the Australian stage to the global stage. Pfizer is proud to contribute to trachoma elimination efforts through the donation of an antibiotic used to treat trachoma, and recently extended its donation until 2025, should it be needed. Pfizer donates the antibiotic to the International Trachoma Initiative (ITI), a program of the Taskforce for Global Health, an independent not-for-profit organization. . . Watch the video below to learn more about the journey of our antibiotic used to help eliminate trachoma, and the global network of people that makes it all possible. At ISNTD d³ 2018, Dr. Goylette Chami from the University of Cambridge, speaks about mass drug administration for tropical diseases and research showing the inequity within recipient communities and implications on access to medicines on the ground. The immensity of human suffering throughout history is unfathomable. For most of our history, our awareness of suffering was limited to those in our own community. But we now live in an age of globalization, bombarded by 24-hour news and images of suffering from around the world. Suffering that used to be hidden now is revealed. With that awareness comes a desire and a responsibility to respond. The field of global health represents one such response. Global health emerged during the past three decades, fueled by a recognition that, as humans, our health is deeply interconnected. As part of the debate, Baroness Shaista Sheehan, the Liberal Democrats Lords Spokesperson for International Development, quoted the [British Society for Immunology, or] BSI’s recent policy briefing on [neglected tropical diseases, or] NTDs in saying that although there had been significant progress with some diseases, “the BSI quite rightly draws our attention to the importance of immunological research in developing new drugs, vaccines and diagnostics for NTDs”. . . She also echoed the BSI’s opinion that if collaborative efforts between industry and research, such as the UK Vaccine Network, were replicated for NTDs, this would speed up the development of diagnostics and vaccines for these diseases. Revisiting the concept of Innovative Developing Countries (IDCs) for its relevance to health innovation and NTD . . .
Catherine M Jones et al. In recent years, social media campaigns aiming to showcase women working at the forefront of global health have resulted in lists like 300 Women Leaders in Global Health. This movement inspired a global organisation called Women in Global Health (WGH) that promotes gender equality in global health leadership . . . However, an equity challenge remains embedded within this movement to increase the visibility and recognition of women leaders and experts in global health. WGH's analysis of the organisational locations of 300 women leaders collected through an open nominations process on Twitter shows considerable regional disparities. Large-scale programs are seeking to control or eliminate infectious diseases with the greatest impact on global health. Many of these efforts target the neglected tropical diseases (NTDs) that disproportionately affect the lives of the poor. Often the aim is to eradicate the causative pathogens . . . Here, we discuss the value of genomic approaches to support disease eradication efforts, particularly by analogy with how conservation genomics is supporting efforts to prevent extinctions. The most important lesson I have learned since becoming the Secretariat Director is that people working to prevent, detect and treat leprosy and its complications, and those affected by the disease, are a very close-knit, unique and special group. Everyone working in or affected by leprosy shares several powerful traits: humility, compassion and a genuine sense of purpose. This community wants to end the disease, and its complications, in our lifetime. Neuropathic pain (NP) can occur as a chronic complication of leprosy neuropathy. NP epidemiology and its impact on patients have not been well documented. This study investigates NP prevalence and impact in the years after patients are declared “released from treatment” (RFT) following multidrug therapy (MDT) completion. Intrusive triatomine bugs such as Triatoma dimidiata in the Yucatan peninsula, Mexico, are responsible for the transmission of Trypanosoma cruzi to humans, which can lead to Chagas disease. The control of these bugs is a challenge as insecticide spraying is poorly effective, and alternative strategies need to be developed for a sustainable control. We tested a novel Ecohealth approach, based on window insect screens manufacture and installation through community participation to reduce the presence of bugs inside houses. Fredy E. Villena et al. In the Americas, 8 million people are infected with Chagas disease, and an additional 90 million people are at risk for infection. Little is known about the role bats play in the sylvatic transmission cycle of Trypanosoma cruzi, the parasite causing Chagas disease. Here, we captured bats in the villages of Palmiche, Pachacutec, Nuevo San Martin, and Mayuriaga located in the Datem del Marañon Province in Loreto, Peru. Venous blood samples were collected by cardiac puncture or from the upper extremities, and trypanosomatids were identified by microscopy and molecularly. Historically referred to as “little dragons”, this week’s NTD is Guinea worm disease. Guinea worm is caused by a parasitic worm that causes severe pain and blisters in those it infects. It is a disease that has been around for as long as time. Mummies from ancient Egypt have been discovered to carry the worms and in the Book of Numbers, the “fiery serpents” infecting the Israelites is believed to have been Guinea worms. Amino acid permease 3 (aap3) coding sequence as a target for Leishmania identification and diagnosis of leishmaniases . . .
Karl Erik Müller et al. Venomous snakes live in Aruba, Belize, Guyana, French Guyana, Martinique, Suriname, Saint Lucia, and Trinidad and Tobago. However, the epidemiology of snakebites in the Caribbean is largely unknown, and no systematic regional register of this disease exists. The district of Dawro in southern Ethiopia is farming country, its fertile soils brimming with life. On steep hills, farmers eke out a living from corn and teff, yam and banana. When the thin air thickens with mist and rain, the copper-colored ground turns to mud. But this fecund earth, a blessing for Dawro’s farmers, can also be a curse. Something in the soil triggers a disfiguring disease that may hobble even the hardiest folk. Selene M. Garcia-Luna et al. Zika Virus (ZIKV) is a new addition to the arboviruses circulating in the New World, with more than 1 million cases since its introduction in 2015. A growing number of studies have reported vector competence (VC) of Aedes mosquitoes from several areas of the world for ZIKV transmission. Some studies have used New World mosquitoes from disparate regions and concluded that these have a variable but relatively low competence for the Asian lineage of ZIKV. Since resources are limited, prioritization of countries or areas for elimination is often necessary. However, this prioritization is frequently conducted in an ad hoc manner. Lower transmission areas are usually targeted for elimination first, but for some areas this necessitates long and potentially expensive surveillance programs while transmission is eliminated from neighboring higher transmission areas. We use a mathematical model to compare the implications of prioritisation choices in reducing overall burden and costs. Insecticide-treated bed nets—a crucial part of malaria protection throughout sub-Saharan Africa and regions of Asia—have long been distributed to people who need them through mass campaigns conducted every three years. But what if there were a more effective way to cover more people with bed nets designed to protect them from being bitten by malaria-infected mosquitoes? Better yet, what if those nets could be distributed at a lower cost and with fewer of the logistical headaches associated with mass campaigns? Synergy in the adulticidal efficacy of essential oils for the improvement of permethrin toxicity against Aedes aegypti L.
Regarding [the July 10 article] “In a Rare Success, Paraguay Conquers Malaria”: The world is at a tipping point in the fight against malaria. This moment is an opportunity to push progress forward rather than risk the dangers of backsliding. Take India as a cautionary tale: When malaria funding was withdrawn in the mid-1960s, the resulting shortage of supplies to spray against mosquitoes led to a resurgence of malaria cases. Sustained funding, coupled with advances in technology and research, provide opportunities to end malaria for good. The vacuole, a compartment inside human red blood cells in which malaria parasites reproduce and develop, takes on a distinct spherical shape just minutes before its membrane ruptures, leading to the release of parasites into the blood stream, according to researchers at the National Institutes of Health and other institutions. The researchers, working with red blood cells from healthy donors, were able to chemically block the sequence of events leading to this rounding of the vacuole. They note that targeting this sequence could inform new treatment strategies against Plasmodium falciparum, the species of malaria parasite that causes the most deaths worldwide and, in several areas, has become drug-resistant. Alexandra B. Hogan et al. This study provides insight into the most important characteristics of a malaria vaccine for at-risk groups and shows how distinct vaccine properties translate to public health outcomes. These findings may be used to prioritise target product profile elements for second-generation childhood malaria vaccines. Fiji has identified the hot spots for dengue fever where officials of the World Mosquito Program (WMP) will release the Wolbachia mosquitoes on Monday to curb the spread of dengue, Zika and chikungunya diseases. Wolbachia is a natural and safe bacteria that reduce the ability of Aedes aegypti mosquitoes to transmit viruses between people. The bacteria-carrying mosquitoes breed with the wild Aedes aegypti mosquitoes in the area, passing Wolbachia to their offspring. Presentations will include a description of the global lymphatic filariasis (LF) situation and the LF elimination goals, a description of the training package and its content, as well as field experiences using the LF MMDP training package. This will be followed by a Q&A session. What will be covered? A mix of interesting tropical medicine cases as well as one hour on the newly released IDSA and ASTMH co-authored neurocysticercosis guidelines, interspersed with relevant cases. Presenters: Leading tropical medicine experts Susan McLellan, MD, MPH, FIDSA, FASTMH, University of Texas Medical Branch, and Christina Coyle, MD, Albert Einstein College of Medicine, will lead the discussion. Dr. Coyle is a co-author of the neurocysticercosis guidelines.